After over a month of blood, sweat and tears, it all boils down to this morning’s G1 final match. This year, Hiroshi Tanahashi and Kota Ibushi have won their respective blocks and will face each other tonight for the fourth time since 2015. 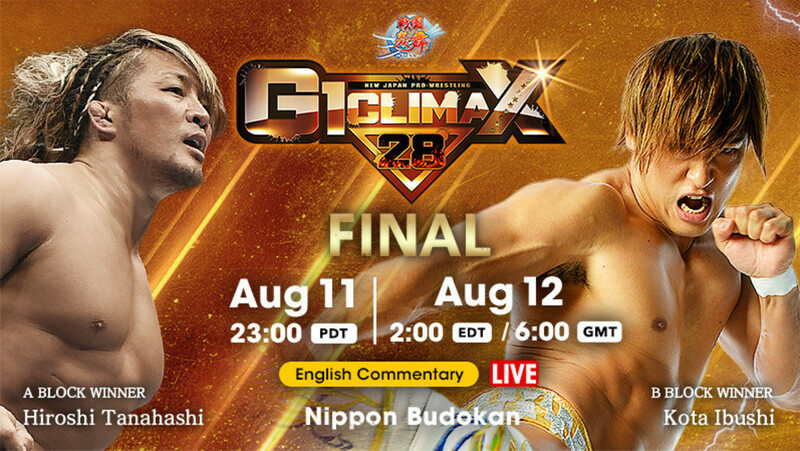 Tanahashi has two wins over Ibushi’s one, so it will be Ibushi who is looking to even the odds tonight. The winner will likely get a title match of their choosing at WrestleKingdom 13 on 1/4. Rey Mysterio also makes his return to New Japan tonight teaming with KUSHIDA and Sengoku Enbu (Ryusuke Taguchi under a mask) to take on Kazuchika Okada and Roppongi 3K. This could be Mysterio’s last appearance with the company, as reports indicate he could be heading back to WWE soon. In addition, there will be a number of tag team matches featuring the likes of Cody, Taiji Ishimori, Taich, The Young Bucks and more. Join us for live coverage starting at 2:00 a.m. EDT. Your typical opening tag featuring Young Lions, here. Honma got a nice reaction, and hit a kokeshi on Umino. Nagata and Elgin tagged in. Elgin hit an enziguri and tagged in Makabe. Makabe hit ten punches in the corner, but ran into an exploder from Nagata. Yoshida got a tag and ran wild on Makabe. Yoshida picked up a nearfall, but Honma and Elgin jumped in for the save. Makabe made a comeback, hit a lariat for a nearfall, then hit the king kong kneedrop, and got the pin. Henare jumped Fale before the bell, looking for the quick win. He hit some tackles, including one off the top, and got a nearfall. Fale quickly recovered, hit the grenade, and the bad luck fall for the pin. This was all action, but there was nothing particularly special about all that action. YOSHI-HASHI looked pretty good. Iizuka jumped Goto and YH with a chair before the opening bell, and beat them around ringside. Taichi and YH started out as the legal men. YH got a bit of offense, including an enziguri, but Taichi made a tag, and Iizuka took over. Iizuka was wearing a muzzle, and Taichi took it off for him, and he started biting YH and Goto. YH made a comeback, hit a headhunter, and tagged Goto. Goto hit a mid kick and suplexed Taichi onto Iizuka. Goto hit a leg lariat, and a high-angle belly to back for a nearfall. Iizuka cut Goto off with some biting, and tagged Taichi. Taichi ate a Saito suplex, and Goto made a tag. YH hit a dropkick on Taichi, who owas draped over the top rope. They traded strikes. Iizuka jumped in with the iron fist, but Goto saved. Taichi hit an axe bomber for a nearfall, then did the pants spot. Taichi hit a powerbomb, and made a jackknife cover on YH, picking up the pin. Taichi went after Goto and YH with his mic stand after the match. They had a nice match. The focus here was on Juice and Cody, and the story of the match was about establishing Cody as a challenger for Juice, probably on the next Long Beach show. Page and Finlay started off with some chain wrestling. Cody got a tag, and got a nice reaction. Finlay tagged Juice, and Juice and Cody went to work. Juice dropped Cody with a dropkick. Finlay got a tag, and Finlay and Juice doubled up on Cody. Cody spit his gum at Finlay, and Finlay chased him around the ring. Finlay ran into a lariat from Page on the floor, and Cody and Page got the heat on Finlay. Cody dropped Finlay onto Page's knees for a gutbuster, and picked up a nearfall. Cody went for a superplex, but Finlay blocked, and hit an uppercut off the second rope. Juice and Page got tags, and Juice ran wild. He hit a lariat, and a high cross for a two count. Juice teased hitting his Dusty jabs, but Page cut him off with a thumb to the eye. Juice recovered and hit a double cannonball on Cody and Page. Cody hit a powerslam, and Page hit a standing shooting star on Juice, earning a nearfall. Cody hit the Dusty jabs on Juice, but Finlay jumped in and cut him off. Page hit Finlay with the buckshot lariat. Juice hit Cody with the jabs, and Cody hit a disaster kick. Juice went for pulp friction, but Cody reversed into din's fire, and got the pin. Cody cut a promo on Juice after the match, with Juice's title over his shoulder, teasing a future US title match. A good match, but below the level of the best Bucks matches, as the focus was more on the storyline with the Tongans than workrate. Tanga Loa did the ring introductions for both teams, and baited The Elite into putting their NEVER 6-Man titles on the line. They brawled around ringside at the start. The Bucks hit stereo suicide dives, and Nick hit a tope con hilo. Back inside, Tonga and Loa cut Matt off, and beat him down. Matt speared Ishimori, and hit double clotheslines on Tonga and Loa, before making a tag to Nick. Nick hit a swanton on Tonga as Matt draped him over the ropes. Tonga slipped out of a more bang for your buck attempt, and Nick accidentally hit Matt with a step-up knee in the corner. Scurll and Ishimori tagged in, and Ishimori hit a handspring kick and a sliding german. Ishimori went for another handspring kick, but jumped into a chicken wing from Scurll, while the Bucks applied sharpshooters on Tonga and Loa. Nick took Tonga and Loa out with a dive to the floor. The Bucks and Scurll hit a triple team move on Ishimori, but he kicked out at two. Ishimori made a blind tag to Tonga, but the Bucks continued to work on Ishimori. Ishimori and Loa took out the Bucks. Scurll jumped in and went went for the finger break spot, but Tonga jumped in and hit a gun stun for the win. The OGs threw down the belts after the match, and left without them. The Bucks and Scurll left with the titles they had just lost. This was a fun, crazy brawl. All eight men brawled around ringside, but the focus was on Naito and Suzuki. Each teased using a chair on the other, but neither did. They started out as the legal men. Naito went after Suzuki's knees. Suzuki got a choke and went for the Gotch, but Naito blocked it. Suzuki-gun trapped Naito in their corner, and orchestrated a four on one. Suzuki used an armbar on Naito on the apron, and Naito sold the left arm in a big way. Sabre got a tag, and Naito quickly made a comeback, hitting Sabre with deep armdrags. Suzuki jumped in and ate an enziguri, before Naito was finally able to tag EVIL. EVIL hit a senton on Sabre for a two count. After a struggle, he hit a fisherman buster. Kanemaru and BUSHI got tags. Desperado jumped in, and he and Kanemaru doubled up on BUSHI. BUSHI was able to tag SANADA, and SANADA tied Kanemaru up with the paradise lock. Suzuki-gun sent three members of LIJ to the floor, and went four on one against SANADA. LIJ jumped back in and went four on one with Kanemaru. The match broke down, and all eight men jumped in. Kanemaru went to spit whiskey in SANADA's eyes, but SANADA ducked it, and used skull end on Kanemaru, who tapped out. This was a mixed bag. They did a lot of comedy at the outset, but the tease of an Omega vs. Ishii IWGP title match was the story driving the action towards the end. White and Owens started off. They traded arm wringers and chops, and Owens dropped White with a kick. White tagged in Yano, and Yujiro got a tag from Owens. Yano hit an inverted atomic drop, then tried to untie turnbuckle pads, but the Bullet Club cut him off. They worked Yano over, utilizing quick tags. They did a comedy spot where Omega and Owens refused to tag Yujiro while they worked over Yano. Pieter jumped in and danced, while the Bullet Club used figure fours on CHAOS. Ishii tagged in, and business picked up. He hammered Omega and walked through all of his strikes. He hit a Saito on an interfering Yujiro, but Owens jumped in, allowing Omega to hit a kotaro krusher on Ishii for a two count. The Bullet Club worked over Ishii three on one. Owens went for a package piledriver, but Ishii bacdropped out of it. Yano and White jumped in for the save, and the CHAOS team briefly went three on one against Owens. Yano, White, Omega, and Yujiro brawled to the floor, leaving Owens and Ishii in the ring. Owens hit a rolling elbow and a lariat on Ishii, and picked up a two count. Ishii came back with a lariat, and hit the vertical drop brainbuster on Owens for the pin. Ishii grabbed Omega's title after the match, and issued a challenge in the ring. Omega asked the crowd if they wanted to see the match, and they cheered. This was a lot of fun. Everyone looked great. They heavily teased a match between Okada and Rey, which is notable, given all the rumors of Rey to WWE being imminent. Enbu was Ryusuke Taguchi dressed as a character for a video game. Rey and Okada started off. Rey ducked a rainmaker, and sat on Okada's shoulders. They went ot the floor, Rey still on Okada's shoulders, then hit a rana, and Okada rolled back inside. Rey went for the 619, but Okada slipped away, and the crowd booed. SHO and KUSHIDA got tags, and KUSHIDA hit a handspring dropkick. KUSHIDA and Rey used a series of quick tags in working over SHO. KUSHIDA used and armbar, but SHO powered out. The other four participants brawled to the floor, while SHO choked KUSHIDA with a boot in the corner. YOH got a tag, and used a waistlock on KUSHIDA. He rolled into a pinfall attempt, but KUSHIDA kicked out. KUSHIDA made a comeback, and hit a handspring back elbow. Enbu got a tag, and hit a series of hip attacks on SHO and YOH. He hit a standing moonsault on SHO for a two count. SHO went for a suplex, but Enbu slipped out and applied an ankle lock. Enbu went for another hip attack, but jumped into a german from SHO. Okada got a tag, and hit a DDT on Enbu for a nearfall. Enbu twisted out of two rainmaker attempts, and hit a hip attack, before tagging Rey. Rey hit a seated senton, slipped out of a tombstone attempt, but ate a flapjack. YOH got a tag and hit a falcon arrow on Rey for a two count. He rolled into a pinning combo for a nearfall. SHO and YOH doubled up on Rey, and teased the 3K, but Rey hit a DDT on YOH, and a rana on SHO. Rey hit an enziguri on YOH and teased a double 619, but Okada cut him off with a dropkick. Enbu and KUSHIDA hit stereo topes on Okada and SHO, allowing Rey to hit a 619 on YOH, and he followed up with a springboard splash for the pin. This was incredible. Either the best or second best match of the tournament. I think Omega and Ishii was better, but if you picked this, I wouldn't argue with you. Omega was in Ibushi's corner, and Katsuyori Shibata was in Tanahashi's. Tanahashi grounded Ibushi immediately, using a body scissors. He teased an armbar attempt, but Ibushi rolled to the ropes, forcing a break. Tanahashi stopped a takedown attempt, then stuffed another, establishing that Tanahashi has an advantage in the wrestling game. Ibushi looked to turn it into a striking battle. Tanahashi appeared willing to trade, but neither man threw any significant strikes, and Tanahashi took it back to the mat. Ibushi got a headscissors after a scramble, and they went back to their feet. Tanahashi hit a shoulder block and played air gutiar, but Ibushi jumped back to his feet immediately, and hit a couple of kicks. Tanahashi grounded him immediately, and attacked the legs with kicks, then applied a triangle scorpion hold, but Ibushi reached the ropes. Ibushi hit a leaping mid kick, dropping Tana, but Ibushi sold the damage to his legs from the scorpion. Ibushi ducked a charge into the corner, hit a powerslam, and followed with a second rope moonsault for a two count. Ibushi hit a double footstomp on the apron, which looked nasty. He hit a series of mid kicks in the center of the ring, but Tana finally caught one, and hit a dragon screw. Ibushi hit another stomp, but Tana hit a pair of dropkicks. He went to the top, but Ibushi cut him off. He teased lawn darting Tana into the corer pad, but Tana countered with a sling blade, and dropkick into the corner. They traded short forearm strikes. Ibushi low-bridged Tanahashi on a charge into the ropes. Tanahashi tried to skin the cat, but Ibushi caught him, and hit a spike package piledriver for a two count. Tana recovered and hit two seated dragon screws, going back on the offensive. He applied a cloverleaf, but Ibsuhi made the ropes. Tanahashi hit a rope-assisted dragon screw, and Ibushi rolled to the floor. Tana hit a high fly flow to the floor. They teased a countout, but Ibushi made it back inside. Tana went for a sling blade, but Ibushi hit a snap rana, sending Tana to the floor. Ibushi hit a springboard 180 moonsault off the top rope to the floor, wiping out Tanahashi. He hit a springboard missile dropkick back inside, and seated Tana on the top rope. Ibushi hit a reverse frankensteiner off the top for a two count, and Tanahashi sold the damage to his head and neck. Ibushi hit a bridging suplex for a two count. He grabbed control of Tana's wrists and went for kamigoye, but Tana rolled him up for a two count. Ibushi hit a bomaye. He went for a last ride, but Tanahashi dropped out of it and hit a big left hand to the face. Ibushi hit a series of palm strikes to the chest, and sent Tanahashi into the corner with a kick. Tanahashi got back to his feet, and hit a palm strike. Ibushi hit a series of strikes, but Tanahashi walked right through them. They traded slaps to the face, but Ibushi ended the exchange with a lariat. From their knees, both men landed short elbow strikes. They got to their feet, and continued to trade. Tanahashi hit a series of uppercut forearms, but Ibushi hit a big palm strike. Tanahashi countered with sling blade for a two count. Tanahashi hit a straight jacket german into a bridge for a nearfall. Tana went to the top for a high fly flow, but Ibushi got his knees up. Ibushi hit a bomaye to the back of Tana's head, and hit a moonsault into double knees across the sternum. Ibushi lawn darted Tanahashi into the turnbuckle pad, and followed with kicks to the back. Tana rolled to the apron, allowing Ibushi to german him back inside. Ibushi hit a last ride for a nearfall, and the building went crazy. Tanahshi contorted away from kamigoye, but Ibushi hit a straight jacket german for two. Tana hit twist and shout twice, and then hit a dragon suplex for two. Tana went to the top for a high fly flow, and hit it to Ibushi's back. Ibushi got to his feet, and Tana hit a standing high fly flow. He went back to the top, hit another, and got the pin. Tanahashi wins his third G1. NJPW Sakura Genesis live results: Kazuchika Okada vs. Zack Sabre Jr.